LUNCH! The universal work force uniter. Do you pack? Do you grab take out? Do you scour the office pantry for granola bars and oatmeal packets (we do!)? This week we provide an in-depth look at one employee’s lunch pattern and the reasons why he ate what he ate. I’m Donny Rambacher and here’s what I had for lunch the week of April 24, 2017. Lunch for me is meant to be relatively healthy, a good way to clean out my home fridge, and my largest meal of the day. Sometimes I meet all three of those requirements and other times my morning prep lacks coordination and I end up with a turkey sandwich. Here’s a little background on my current food situation. In October, I bought a house with my fiancé and we decided to go all HGTV and knock down some walls in the kitchen to make the space more open. Currently, the kitchen is under construction and the only available countertop space is about 2’x3’. Monday night I discovered a mouse found his way into our oven drawer through an opening in our wall. By Tuesday morning he had been ‘removed’, but it did put a slight hiccup in my morning cook sessions. 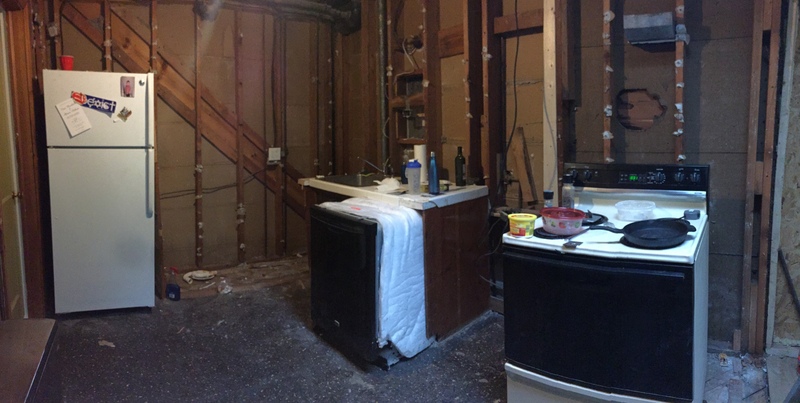 My extensive cooking space – currently under construction. Tuesday – Classic Donny Turkey Sandwich. After seeing the mouse Monday night I was not in a mood to do much cooking come Tuesday morning. I grabbed a bag of lunch meat and headed on my way. Don’t be fooled by the sounds of this sandwich, I make it as gourmet as possible in an office kitchen. I keep a loaf of bread in the freezer at work so it never goes bad. For my sandwiches, I take out two slices of bread and throw them in the toaster. The thawing and toasting work in tandem and in the course of two minutes I have the entire office smelling like a bakery and some bread that tastes like it just came out of the oven. I carefully stack the turkey so that the entire sandwich is level and not bulging in the middle. I add honey mustard, or whatever mustard I have on hand, sriracha and two dashes of cayenne pepper (I like it hot). The lunch meat is cold, the bread is warm, together they exist in harmony. 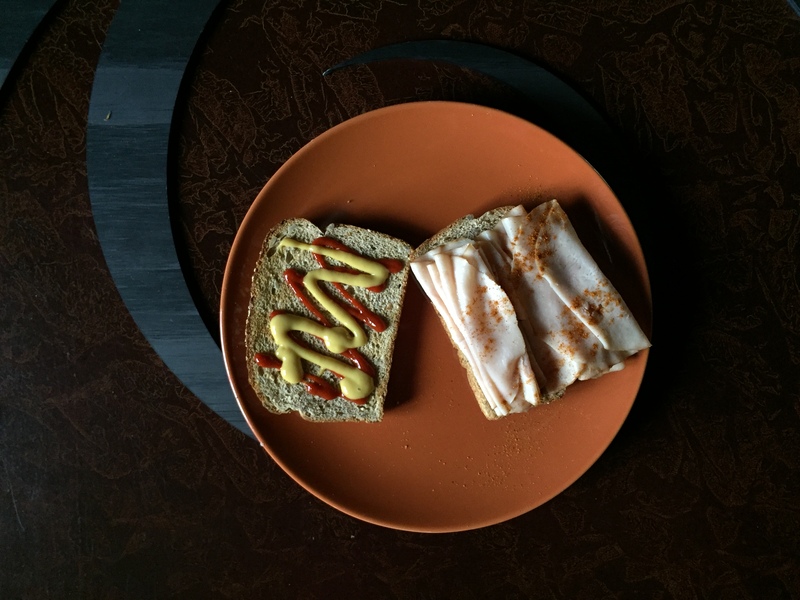 TUESDAY: Sriracha, honey mustard, turkey, toast and two dashes of cayenne. Wednesday – Feeling overwhelmed by the amount of leftovers existing in my home refrigerator, I decided to take matters into my own hands. I brought in leftovers from Saturday night – chicken parmesan. The key to a good chicken parm is a crisp breading and tender chicken. I heated the chicken in our office toaster oven for the desired texture and the pasta in the microwave. The pasta was hot and the chicken was crispy. Perfection. A few drops of sriracha and cayenne made this dish complete. WEDNESDAY: Two types of pasta and chicken parmesan. Carbs to the max. And the Euro-Pro toaster oven used to prepare the chicken. Thursday – A bit of a toss up. Feeling quite tired in the morning, I walked out to the car wearing my slippers and forgetting my lunch. Realizing my mistake I ran back in the house and grabbed an assortment of leftovers and proper footwear. I brought in a salad I prepared Monday morning and a stir fry I made Wednesday morning before work. For lunch, I went with the stir fry. It was made using instant brown rice, chicken marinated in soy sauce, two duck sauce packets, olive oil, salt, pepper and garlic powder. I also added an assortment of roasted vegetables and steamed broccoli from the week before. I reheated the vegetables in a pan using butter and soy sauce to give it an asian flare and mixed them together with the rice and chicken. A soy sauce and hot mustard packet were added and my bowl was good to go. It may have received some attention from the cayenne pepper which holds a special place on my desk. 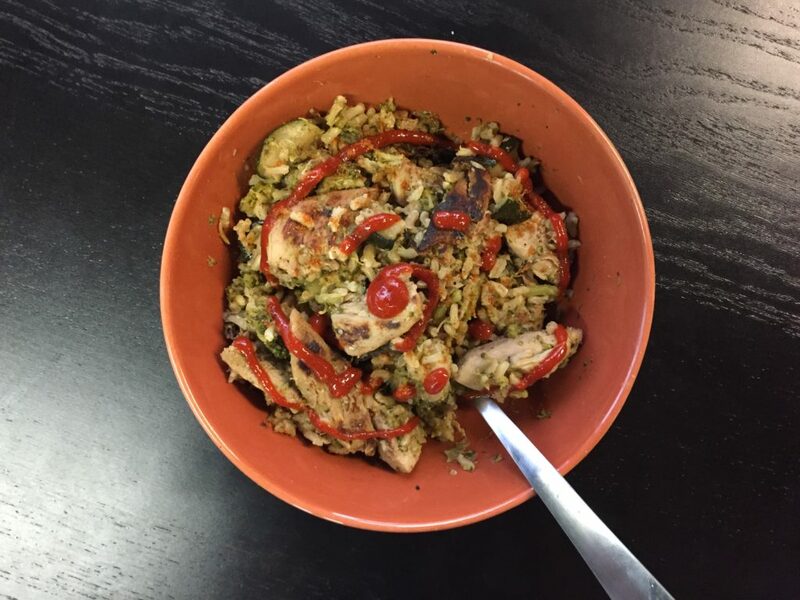 THURSDAY: Chicken stir fry with a drizzle of hot sauce. Friday – I came to the office packed with leftovers, nearly half my fridge, excited to eat none of them and Ian promptly mentioned the idea of going out to lunch as a group. I was honored and excited. We first looked for places with patios, but quickly realized it was not that warm out. Instead we chose a place called Brick House Tavern + Tap. We made the obligatory jokes about the song by The Commodores and off we went. Lunch was delicious! We started with a plate of soft and pillowy pretzel sticks with an assortment of cheese dips and a seven layer dip with warm pita bread. 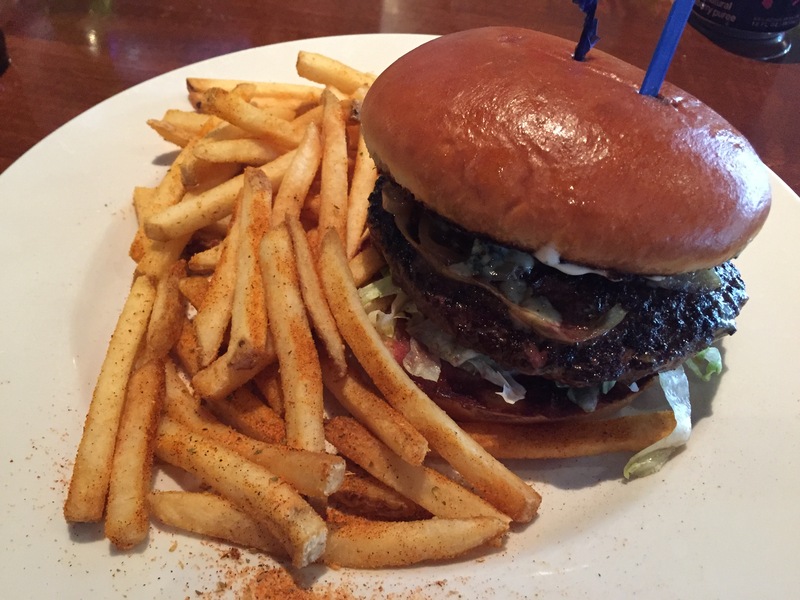 For the main course I had a Black & Bleu burger, cajun spices, bleu cheese and caramelized onions cooked to medium. It was between that and a chicken sandwich, but I saw another woman eating the chicken and it looked cumbersome. I wanted a juicy, melt-in-your-mouth-burger. And I got it. Thanks Array! In the end, lunch should be fun. Take a couple extra minutes and throw something in the toaster as opposed to just the microwave for a variety in texture. Give yourself a slight break in the middle of the day to make lunch special and something you are excited to eat. I use lunch to clean out my fridge and make things for myself that I couldn’t necessarily prepare for a large group because tastes differ. And if you’re ever unsure about a meal, make it spicy!